Vembu recognizes the need of Small and Medium Businesses that run critical data centers, and is prepared to meet their data protection needs with server clustering techniques to simplify and scale their architectural setups. For Service Providers, who manage complex data centers and provide rapid services in time of server crashes of their clients, Vembu offers a Cluster Deployment solution. Vembu BDR supports installing multiple Vembu BDR Server instances (Nodes) in a cluster to provide load balancing of the clients. As per the load balancing algorithm Backup and Restore requests from the client machines are directed to one of the cluster Nodes. The backup server instances(Nodes) can be scaled up or down based on the capacity at runtime. The Nodes share a common RDBMS database and a common backup storage as well. 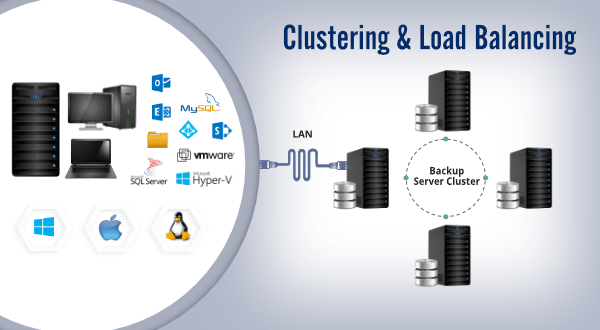 The illustration below shows how a new client machine registers with the Backup Server cluster and initiates its backup.